on parle de nous dans le huffingtonpost !!! Home / on parle de nous dans le huffingtonpost !!! Small companies are making the most of EVs in the UK, France, Germany, Spain and Italy. Across the UK and Europe, the number of small businesses embracing the use of electric vehicles (EVs) and green transport innovation is rapidly increasing. The incentives are clear: in the UK for example, the Climate Change Act of 2008 means that the country is legally obliged to significantly cut emissions. Indeed, this is a pattern we’re seeing all across Europe. Diesel cars will be banned from the centres of many cities in the next ten years, including Madrid, Paris and Athens, while countries like Holland are seeking to exploit vehicle-to-grid technology, using EVs to produce power for businesses and homes. With this in mind, businesses are beginning to see the huge benefits of going electric. And that’s before we even consider two other major advantages; firstly, that governments across Europe provide tax breaks and grants for using EVs; and secondly, that study after study proves consumers are more likely to be attracted to businesses that promote environmental sustainability. Here’s a look at five small businesses across Europe reaping the rewards from making the change to EVs. Maxime Asselin and Christophe Descombes established Le Kangourou Vert in October 2009, a logistics company that specialises in the short distance delivery of smaller packages in three cities: Orléans, Tours and Auxerre. Realising that the use of big trucks to make such deliveries in the city centre was not only inefficient but also far worse for the environment, they came up with the idea of using vehicles that were not only more appropriate for this kind of job but also more environmentally friendly. When the Nissan e-NV200 arrived on the scene in 2014, it was a no-brainer for Le Kangourou Vert. The vehicle’s rapid charging battery, ability to travel greater distances on one charge, not to mention ample load space, made it the perfect fit for a company looking to build an environmentally-friendly but cost-effective company. 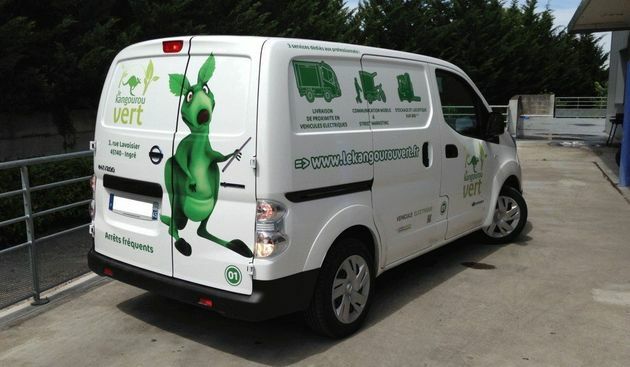 They now have 18 of Nissan’s e-NV200’s on their fleet, and with green issues becoming increasingly important to people and businesses across France, Le Kangourou Vert certainly has a spring in its step.